The Irish head to New London, North Carolina, on Friday to begin their push for an ACC championship, with the tournament taking place on the 7,102-yard, par-72 course at Old North State Country Club. The 54-hole championship will take place from Friday through Sunday this weekend. Along with Boston College and No. 48 North Carolina State, Notre Dame will begin the championship with an 8:30 a.m. tee time Friday morning. In their last showing, the Irish finished in 11th place at Vanderbilt’s Mason Rudolph Championship at the Legends Club, where sophomore Matthew Rushton paced the team and finished in 27th place with a score of 222 (69-76-77). The ACC boasts 10 teams in the top 50 of the GolfStat.com rankings and five in the top 30, including No. 1 Florida State, defending conference champion No. 11 Georgia Tech, No. 19 North Carolina, No. 23 Wake Forest and No. 28 Virginia, while the Irish check in at No. 155 in the national rankings. 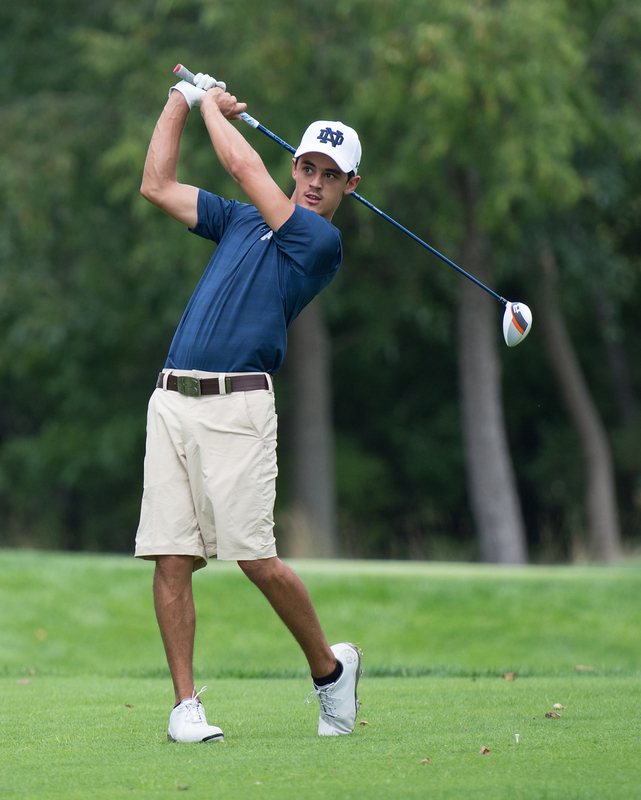 Junior Zach Toste holds his finish at the Notre Dame Kickoff Challenge at Warren Golf Course on Aug. 31. The team placed first at the tournament, posting a 561 team score for 36 holes. “Even players who had played some in the past were in new roles this year, so we had some bumps in the road early on,” Kubinski said. “It’s exciting, though, to see the evidence of our players improving in recent weeks. We didn’t have a senior in the lineup over the two-tournament spring break. All season long, Notre Dame’s team has featured predominantly underclassmen. This weekend is no different, with the five players teeing it up at the ACC championship being Rushton, Steve, Barens, as well as junior Cory Sciupider and senior Tyler Wingo. With arguably the stiffest competition in the country meeting in New London, the young Irish will have their work cut out for them, but they will use the experience as something to build on for the coming season starting in the fall, Kubinski said. A season ago, the Irish posted a seventh-place finish in their first-ever appearance in the ACC championship. This year’s edition of the ACC championship will tee off Friday morning at 8:30 a.m. at Old North State Country Club in New London, North Carolina.